BACKGROUND AND PURPOSE: The timely re-establishment of intracranial perfusion, the effective prevention of early recurrent strokes, and the limitation of the incidence of reperfusion injury are the major factors that are key to successful treatment of patients with hyperacute stroke who had severe ipsilateral cervical internal carotid artery (ICA) stenosis. In an effort to reduce both the extent of the ongoing neurologic injury and the risk of early recurrent stroke, we have adopted an aggressive combined endovascular approach of intracranial thrombolysis and cervical carotid stent placement during the hyperacute phase. We report on the results of 5 such consecutive patients who presented to our center from January 2003 through January 2005. MATERIALS AND METHODS: From January 2003 through January 2005, 5 consecutive patients presented to our center with hyperacute strokes and severe ipsilateral cervical ICA stenosis. All were treated with emergent carotid stent placement and intra-arterial thrombolysis. The medical records were reviewed and summarized. RESULTS: One patient died. The remaining 4 patients had an average hospital stay of 4 days (range, 3–5 days) and a mean National Institutes of Health Stroke Scale (NIHSS) score of 2 (range, 0–3) at the time of discharge. With a mean clinical follow-up of 11 months (range, 6–24 months), all had excellent functional outcome with a modified Rankin score of 0 or 1. CONCLUSIONS: Data on emergent carotid stent placement in the hyperacute management of stroke are limited. The summarized experience in these 5 patients demonstrates the feasibility of this aggressive therapeutic strategy that may bring about a good outcome. The conventional management strategy for patients who have experienced stroke in the prior 6 hours (hyperacute stroke) with severe cervical internal carotid artery (ICA) stenosis is to emergently recanalize the intracranial circulation but delay the cervical ICA intervention for 4–6 weeks. However, it is well established in the literature that patients with large-artery atherosclerosis have a particularly high early risk of recurrent stroke (as high as 5% per week) compared with other etiologic subgroups.1,2 In addition, when the residual lumen is <30% or <2 mm in the presence of carotid lesions, the distal perfusion pressure is compromised significantly,3 as sometimes evidenced by the delayed contrast arrival into the distal ICA, or evidence of collateral flow of contrast toward the symptomatic cerebral hemisphere, or both. In the absence of sufficient collateral circulation, low cerebral perfusion pressure can worsen the ongoing ischemia and cause additional infarct in the watershed areas. Furthermore, after successful intracranial recanalization, early intracranial reocclusion has been reported to occur frequently and is usually associated with poor clinical outcome.4,5 In the presence of severe cervical ICA stenosis resulting in compromised distal perfusion pressure, the risk of developing early in situ ipsilateral intracranial reocclusion may be increased. Therefore, the strategies for management of hyperacute stroke in this group of patients should conceptually aim to reduce both the extent of the ongoing neurologic injury and the risk of early recurrent stroke. This may be achieved through the combined emergent endovascular approach of intracranial thrombolysis and placement of a cervical ICA stent. Nonemergent angioplasty and stent placement for ICA stenosis has been reported to be technically feasible and equivalent to carotid endarterectomy (CEA) for prevention of stroke.6,7 In managing patients affected by hyperacute stroke with carotid occlusion, our center has adopted an aggressive combined emergent endovascular approach of intracranial thrombolysis and cervical ICA recanalization. Our published results were quite encouraging.8 Other authors have reported similar results with the same strategy in treating acute symptomatic carotid occlusion.9 To examine the feasibility of expanding this combined emergent endovascular approach to treating patients affected by hyperacute stroke with severe ipsilateral cervical ICA stenosis and no other apparent embolic sources, we report a retrospective review of 5 such consecutive patients treated at our center from January 2003 through January 2005. From January 2003 through January 2005, 730 patients were treated for ischemic stroke at our institution. Patients considered for endovascular recanalization therapy met the following criteria: 1) they were between the ages of 18 and 75 years, 2) the clear time of onset was within 6 hours, 3) they had an NIHSS score >7, and 4) the intra-arterial (IA) thrombolysis could be initiated within 6 hours of onset of the stroke. Patients excluded from endovascular recanalization therapy met the following criteria: 1) any form of intracranial hemorrhage; 2) pregnant or lactating women; 3) major trauma within 3 months; 4) history of brain tumor, arteriovenous malformation, or aneurysm; 5) major surgeries within 14 days; and 6) severe systemic diseases with a life expectancy <3 months. A subset of patients presenting with hyperacute strokes and ipsilateral cervical ICA stenosis (>90%) so severe as to preclude safe and ready intracranial access were included in this analysis. Five patients were identified. CT scans of the head were obtained at the time of the initial evaluation; none had preintervention acute neuroimaging evidence of hypoattenuation or hemorrhage. Endovascular interventions were performed with the patients under minimal sedation. Interval neurologic examinations were performed routinely. All 5 patients were treated emergently with carotid angioplasty and stent placement followed by intracranial thrombolysis. A 2-mm, low-profile balloon was used for angioplasty to minimize trauma to an unstable plaque. No heparin was used for the endovascular intervention. Postprocedure, all 5 patients were treated with an intravenous (IV) bolus of abciximab followed by 12-hour IV infusion. All were placed on 1 aspirin (325 mg daily) and 1 clopidogrel (75 mg daily) without any loading dose. Postprocedure, all patients were managed in the Neuro Critical Care Unit. Systolic blood pressure was strictly controlled (within 120–130 mm Hg) for at least 48 hours postprocedure. All patients were followed up in both the Stroke Clinic and the Carotid Clinic. The Table summarizes the overall clinical characteristics, treatment, and outcomes of the 5 patients. The mean age of the patients was 62 years (range, 53–66 years). In all 5 patients, there were associated distal intracranial emboli in addition to the cervical ICA stenosis. None had clinical evidence of cardiac embolism. The intracranial artery occlusion occurred most likely because of an artery-to-artery embolism originating from the ipsilateral proximal high-grade ICA stenosis. The mean presenting NIHSS score was 14 (range, 7–22). None of the 5 patients had symptomatic intracranial hemorrhage postintervention. The remaining 4 patients had an average hospital stay of 4 days (range, 3–5 days) and a mean NIHSS score of 2 (range, 0–3) at the time of discharge. All 4 patients were discharged to home. They had a mean clinical follow-up of 11 months (range, 6–24 months). All had excellent functional outcome with a modified Rankin score of 0 or 1. No restenosis was detected at a mean follow-up of 8 months (range, 3–18 months). This 65-year-old man (patient 1, Table) presented with aphasia and right hemiplegia. Despite administration of IV tPA, the patient continued to have significant deficits, with an NIHSS score of 22. The diagnostic angiogram showed a severe left cervical ICA stenosis (Fig 1A) and distal ICA occlusion involving both the left M1 and A1 segments (T-lesion, Fig 1B). Carotid stent placement with a 5 × 20-mm Precise stent (Cordis, Miami Lakes, Fla) was performed emergently (Fig 1C), followed by the intracranial intra-arterial administration of tPA (10.5 mg) and abciximab (25 mg) as seen in Fig 1D,-E. Postprocedure, the patient received an IV bolus of abciximab followed by a 12-hour IV infusion. Clopidogrel was started the same night. The patient was discharged home on hospital day 4 with an NIHSS of 3. At his 6-month follow-up visit, the patient had no neurologic deficits, and the stent remained widely patent as shown on carotid Doppler. A 65-year-old-man presented with aphasia and right hemiplegia with a NIHSS score of 22 despite IV tPA. The diagnostic angiogram shows a severe left cervical ICA stenosis (A) and a distal ICA occlusion involving both the left M1 and A1 segments (T-lesion) (B). Carotid stent placement with a 5 × 20-mm Precise stent was performed emergently. 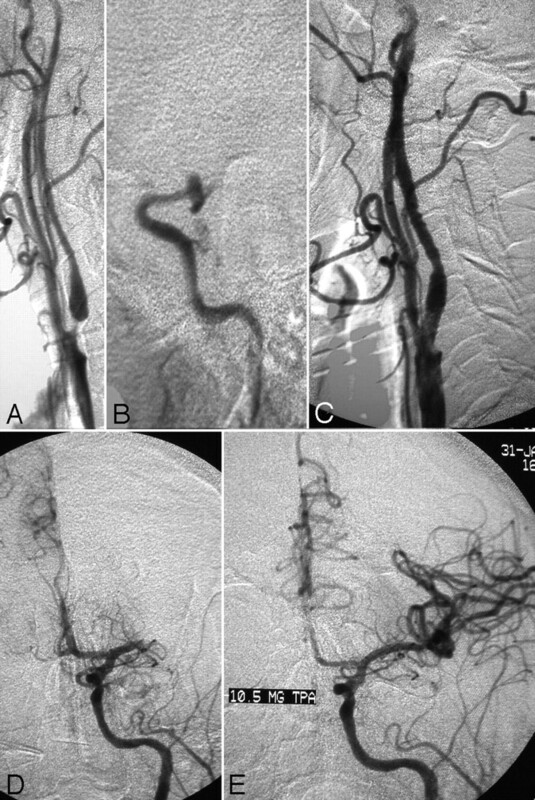 The angiographic result after the carotid stent placement is shown in C, and the angiograms at the midthrombolysis and the final recanalization phase are shown in D and E, respectively. Patients with large-artery atherosclerosis, such as ICA stenosis, have a particularly high risk of early recurrent stroke (as high as 5% per week) in the first several weeks.1,2 The 2 major factors in determining the clinical outcomes of patients presenting with hyperacute strokes and severe ipsilateral ICA stenosis would be the timely re-establishment of the intracranial circulation and the effective prevention of early recurrent strokes. The currently accepted management strategy for such patients is to emergently recanalize the intracranial circulation but delay the cervical ICA intervention for 4–6 weeks. This practice of delaying the cervical ICA intervention may have stemmed from the carotid endarterectomy data that showed increased perioperative complications when the procedure was performed in the acute phase (the initial 1–2 weeks after a stroke). Most of the data,11–14 however, were from the pre-CT era, and their relevance to the modern management of stroke needs to be seriously questioned. In addition, this surgical procedure does not address the intracranial pathologic lesion and therefore has a very limited role in the hyperacute management of stroke. The risk of reperfusion injury, a feared complication of carotid intervention in the acute phase, is poorly defined in the hyperacute phase in which cerebral ischemia may still be reversible. Carotid stent placement has been newly established as an alternative treatment to carotid endarterectomy. It has a unique advantage to be incorporated as part of the endovascular intervention in the hyperacute management of patients who have suffered a stroke. Carotid stent placement may stabilize the vulnerable plaque in the hyperacute phase and reduce the risk of early recurrent stroke. In addition, when the residual lumen is <30% or <2 mm in the presence of carotid lesions, the distal perfusion pressure is significantly compromised.3 Carotid stent placement may therefore augment many crucial collateral flows to the distal ischemic tissue. This may potentially reduce the risk of hemorrhagic complications by increasing the tolerance of the distal vascular territories to ischemia. The increased distal perfusion pressure may also decrease the area of subclinical or marginal ischemia. Intracranial reocclusion after IA thrombolysis occurs frequently (20% or more).4,5 Such reocclusion may be related to the volume and velocity of the blood flow, the amount of residual thrombus, the severity of residual stenosis, and the degree of in situ platelet activation. We have observed that a small amount of distal subocclusive thrombus may dissolve spontaneously if the proximal blood flow is augmented. After carotid stent placement, the distal vascular territories may receive a more robust blood flow with both increased volume and velocity. This could minimize the required doses of thrombolytics during the procedure and reduce the risk of in situ reocclusion or hemorrhage during and after the procedure. After emergent carotid stent placement, it is a valid concern that rapid restoration of normal perfusion pressure may result in hyperperfusion or hemorrhagic complications in the distal vascular territories, with possibly impaired autoregulation from chronic ischemia. Optimal control of blood pressure is critical. Although the ideal target blood pressure has not been established for this population of patients after revascularization and thrombolysis, our experience shows that reasonable lowering of systolic blood pressure may avoid reperfusion injury without compromising the perfusion. Postprocedure, all patients were managed in the Neuro Intensive Care Unit. Their systolic blood pressures were strictly controlled (below 120–130 mm Hg) for at least 48 hours. Intracranial thrombolysis with agents such as tPA inevitably activates the coagulatory system.15 Thrombin generated by plasmin, a by-product of thrombolysis, is a potent platelet activator.16 The aggregating platelets may contribute significantly to the in situ reocclusion. In addition, platelets contain matrix metalloproteinases that may result in the loss of microvascular integrity and hemorrhagic complications.17 Present laboratory and clinical studies suggest that glycoprotein IIb/IIIa (GP IIb/IIIa) antagonists may have synergistic effects with thrombolytics in achieving arterial reperfusion.17,18 Their potent antiplatelet-aggregation effects may also minimize the risk of in situ reocclusion and hemorrhagic complications by preserving the microvascular integrity.17 After emergent carotid stent placement, all of our patients were treated with IV bolus abciximab followed by 12-hour IV infusion. No symptomatic intracranial hemorrhagic complications were observed. At present, the use of GP IIb/IIIa antagonists in the management of ischemic strokes remains controversial. In our experience, the use of abciximab in selective patients may be beneficial. In our experience, if a carotid stenosis is severe enough to compromise distal perfusion pressure, dilating the cervical ICA first would improve the chance of successful recanalization of intracranial occlusion. Varied combinations of pharmacologic therapy, mechanical clot disruption with a microcatheter, intracranial angioplasty or stent placement, and use of a clot retrieval device may further improve the success of recanalization. However, if a carotid stenosis is not severe enough to reduce distal perfusion pressure but acts as an embolic source, intracranial occlusion should be treated first. Performing secondary carotid stent placement should be balanced against the potentially increased procedure-related complications in a patient with a vulnerable plaque and ongoing ischemic injury to the brain. In addition, an alternative strategy with medical treatment (antiplatelet and anticoagulation agents) to reduce the risk of early recurrent stroke has proved benefits. Data on emergent carotid stent placement in the management of hyperacute large-vessel ischemic stroke are limited. There are some emerging data on carotid stent placement in the acute phase after a stroke.20,21 The indications and complication profiles, however, are different when carotid stent placement is performed as a hyperacute intervention. Our summarized experience in these 5 patients strongly suggests the feasibility of this aggressive endovascular strategy that may bring about a good outcome. The small number of patients and the retrospective nature of our review defy any conclusive remarks. Our data are very preliminary and require further studies with rigorous scientific validity. As the technology continues to evolve and the endovascular treatment becomes more accessible, such combined multimodality hyperacute interventional treatment for large-vessel ischemic stroke may be the solution to this disease process that carries high rates of mortality and morbidity. We thank JoAnna Gass for her assistance in the preparation of the manuscript. Zaidat OO, Alexander MJ, Suarez JI, et al. Early carotid artery stenting and angioplasty in patients with acute ischemic stroke. Neurosurgery 2004;55:1237–42; discussion 1242–43. Accepted after revision October 14, 2006.